In this article we are going to show you how to find your Paid Memberships Pro member lifetime value. Using different options and features in Users Insights plugin, we will be able to find and sort the members by this data. We will learn how lifetime value is an important metric in making important business decisions and retaining your existing or bringing back your old customers. If you are running a subscription based online business, lifetime value for you simply means the sum of total payments a member has made on your website. This is an important field in determining your most valuable members and how to remarket them for your new services or subscriptions plans. So, let’s dive in and learn how it is done and how we can perform different operations using filters. Paid Memberships Pro plugin lets you get access to all the features and options that are required to run a subscription based online business. Using Paid Memberships Pro, you can enhance the functionality of your subscription based website and sell subscription plans to users more efficiently. Paid Memberships Pro plugin gives you important insights and features such as content restriction, popular payment gateways and customizable reports and member dashboards. Member Lifetime value is the easiest to figure out but one of the most important metrics in business. This is simply because it gives you an idea as to how much repeat business you can do with a member. After knowing your subscribers’ mentality, you can better decide how and where to allocate your resources in customer retention and other services. 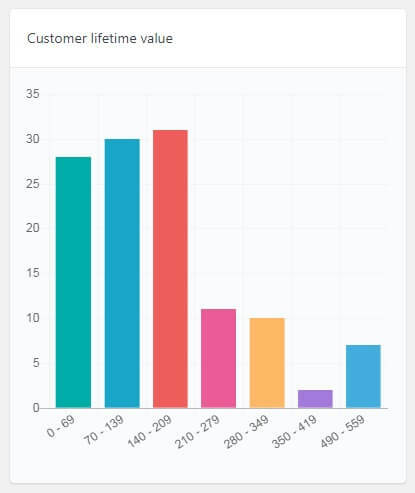 Let’s show you how you can combine the lifetime value column and lifetime value filter in Users Insights to get the desired results. Using a combination of filters, you can extract member data that you can use in your retargeting and marketing campaigns. For example, if you want to know all the users having a lifetime value of at least 350 or higher, you can apply the filter “Lifetime value is bigger than 350”. Similarly, if you want to know all your members with a lifetime value that is less than 250, you can apply the filter “Lifetime value is smaller than 250”. You can also apply a set of filters to get very specific results but we will cover that later on in this article. There is also an option to combine two filters to show very specific data. For example, if you want to show only Gold Level members with a lifetime value of more than 400, combine two filters “Level is Gold” and “Lifetime value is bigger than 400”. When devising a marketing strategy, you need to know your members really well in order to target them for new offers and services. Another scenario is where you want to learn which users cancelled their memberships and also their lifetime values. Combining two filters “Status is Cancelled” and “Lifetime value is bigger than 150” will get you your desired results. This data will help you decide how much business you can bring back if you put together a marketing strategy to bring these subscribers back. Now, this data holds vital importance for any subscription business owner. There are some useful operations that you can perform after exporting this data. You can click on export button to export the selected data and then open it in any spreadsheet like excel, apply average or sum formula and calculate the average or sum of lifetime value of the members. You can change these filters and test a combination of these to get your desired results. This will give you vital knowledge on how to set an ideal marketing budget. Then you can take business decisions based on the reality of your own numbers rather than having to rely on external sources. More info on how to export your Paid Memberships Pro Data here. Knowing your members is important because only then would you be able to retain your existing subscribers and involve them in your new offers and services. For example, if you want to get the lifetime value data of your members from the United States only, you can apply the filters “Country is United States” and “Lifetime value is bigger than 250”. These set of filters give you that extra bit of freedom to go that extra mile when it comes to serving your members. You can try a combination of different filters to know about your most loyal, least active, highest spending and least spending members. Whether it is about retaining the existing members or bringing back those who cancelled their subscription, these insights will be definitely useful in making important business decisions. Reports present all user data together and are a good source of getting a real-time summary of the member data. Reports can be very helpful in identifying problems, keeping track of your goals and making important business decisions. You can head over to Reports (Users Insights > Reports) to get a real-time report on your members’ lifetime value. This a nice graphical presentation of customer lifetime value and you can interpret this data easily and quickly, as opposed to scraping data through a number of columns. In this article, we talked about how to find the Paid Memberships Pro member lifetime value. We also talked about applying different filters in addition to the lifetime value filter to get specific results. We learned how to generate real-time reports and how reports represent data quickly and efficiently. Finally, we shed some light on how the lifetime value can be important in identifying the problems and making important business decisions. We hope this article helped you learn more about the features of Users Insights and get important insights on your members.